Description: The steep prow that forms the left edge of Sean's Roof. From a low sit start on the horizontal rail (No cheeky crouching starts) work directly up the prow on crozzley crimps to the slopey break, then use undercuts in the crack to reach over the capping roof to a finishing hold on the edge (dug out) of the grass at the top. Slow drying. 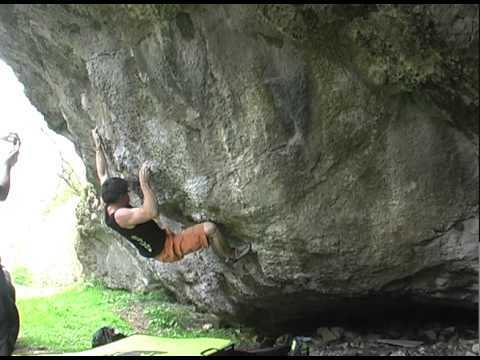 In a couple of the videos included here, climbers drop off well before the end of the problem, which originally finished on jugs 1 metre up and right of where most people now finish.